Call A to Z Entertainment, Inc. today for free information about how to hire or book award-winning gospel music singer Natalie Grant. Having helped hundreds of clients, we are your best booking agent and agency booking and hiring Christian music singer Natalie Grant! We book and help you hire any live Gospel and Christian musicians, singers, and music groups. We can also help you plan and produce your event if you like, so call us now at 888-655-4575. Natalie Grant is a Grammy Nominee and a six time Gospel Music Association (GMA) Dove Award winner. She received the Gospel Music Association’s Dove Award for Female Vocalist of the Year in four consecutive years (2006, 2007, 2008 and 2009), and again in 2012. She was also nominated for a Grammy in 2012 for her performance of “Alive”. Her signature song is “Held”. “When we live the love of the Gospel out loud, a revolution will occur.” This declaration from Christian singer and songwriter Natalie Grant represents the heartbeat of her musical offering, Love Revolution. A powerhouse vocalist, heart-gripping songwriter and charismatic performer, Grant reminds us of the simple significance of love and the revolutionary power that it carries. “Your Great Name” was Natalie Grant’s third single from the Love Revolution album, following the release of “Greatness of our God” and “Human,” the latter of which was performed live by Grant and American Idol winner Jordin Sparks (who co-wrote the song) on the national television broadcast of the 41st Annual Gospel Music Association (GMA) Dove Awards in April of 2010. Love Revolution represents musical styles as diverse as her own influences—from soaring ballads like “Power of the Cross” and worshipful songs like “Your Great Name,” to the R&B/funk vibe heard in songs like “Beauty Mark” and “Someday Our King Will Come.” With Grant’s husband, Bernie Herms, at the helm of production, Love Revolution is a cohesive project that speaks to the hearts of listeners, motivating them to be the change that they want to see in their world, challenging each of us to start a love revolution. The potential reach of this message, and the impact that it can have, is staggering. 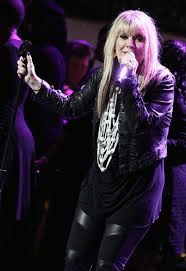 As GMA Female Vocalist of the Year for four consecutive years (2006-2009) and the top-selling Adult Contemporary female solo artist in 2005, 2006 and 2008, Natalie Grant is among a select number of artists to have achieved a formidable foothold at mainstream media and radio. Her 2005 breakthrough album, Awaken, received RIAA Gold certification and its follow-up, Relentless, has experienced significant sales since its 2008 release. But it is the message of the Gospel, and the revolutionary power of love it carries, that she waves as her banner and her hope. Beyond her artistry, Natalie declares this message as an outspoken advocate for victims of human trafficking. The Home Foundation, which Grant created in 2005, has raised over a quarter of a million dollars to fight the trafficking of women and children for the purpose of sexual exploitation. She works to balance these endeavors with her greatest calling—as a wife and mother. After giving birth to twin daughters, Grace and Isabella, in 2007, Natalie Grant and her husband—who were told that may never conceive—welcomed another miracle baby girl, Sadie Rose, in December of 2010. Natalie Grant’s albums include 1999: Natalie Grant, 2001: Stronger, 2003: Deeper Life, 2005: Awaken, 2005: Believe, 2008: Relentless, 2010: Love Revolution, and 2013: Hurricane. With over twenty years of successful experience, we are your best agency for booking and hiring Christian singer and songwriter Natalie Grant. We can help you book or hire any Gospel or Christian musicians. Call us at 888-655-4575 today and tell us about your event; we’ll be happy to help you! A to Z Entertainment, Inc. is not the exclusive booking agency for any artists on this site.